For those who are interested, an English translation of the Midnight Office and Paschal Matins are provided below. Please forgive any inaccuracies as the text has been translated from Greek rather than Georgian. 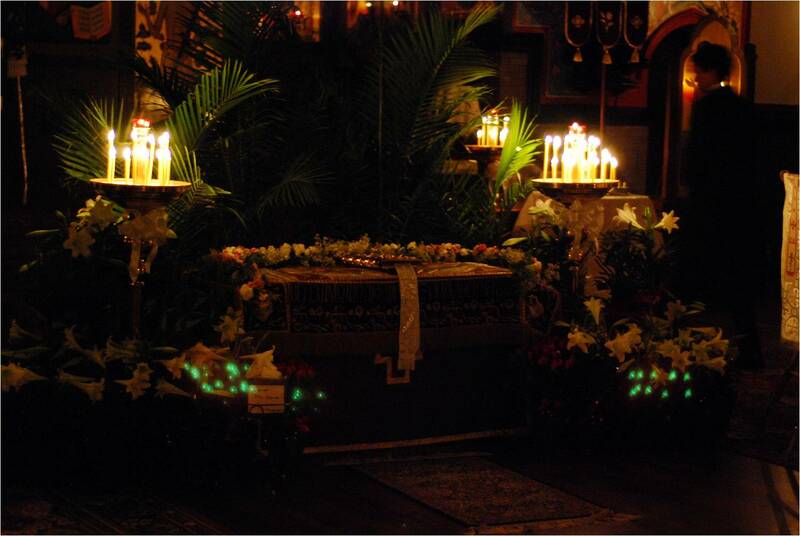 Midnight Office for Pascha begins at 11:00 P.M. Priest: Blessed is our God, always, now and ever, and unto the ages of ages. O Heavenly king, Comforter, Spirit of Truth, Who art everywhere present, and fillest all things, Treasury of good things, and Giver of life: Come and dwell in us, and cleanse us of all impurity, and save our souls, O Good One. O Most Holy Trinity, have mercy on us. O Lord, blot out our sins. O Master, pardon our iniquities. O Holy One, visit and heal our infirmities for Thy name’s sake. Priest: For Thine is the kingdom, and the power, and the glory: of the Father, and of the Son, and of the Holy Spirit, now and ever, and unto the ages of ages. Irmos, Tone 6: He Who in ancient times hid the pursuing tyrant beneath the waves of the sea, is hidden beneath the earth by the children of those whom once He saved. But let us, like the maidens, sing unto the Lord, for gloriously is He glorified. O Lord my God, I will sing to Thee a funeral hymn, a song at Thy burial: for by Thy burial Thou hast opened for me the gates of life, and by Thy death Thou hast slain death and Hades. All things above and all beneath the earth quaked with fear at Thy death, as they beheld Thee, O my Saviour, upon Thy throne on high and in the tomb below. For seeing Thou wert mortal is beyond understanding, O Author of life. To fill all things with Thy glory, Thou hast gone down into the nethermost parts of the earth: for my substance that is in Adam is not hidden from Thee, but when buried, Thou dost restore me from corruption, O Lover of mankind. Katavasia, Tone 6: He Who in ancient times hid the pursuing tyrant beneath the waves of the sea, is hidden beneath the earth by the children of those whom once He saved. But let us, like the maidens, sing unto the Lord, for gloriously is He glorified. By a tomb and seals, O Uncontainable One, wast Thou held of Thine own will; but through Thine energies Thou hast showed Thy power by Divine action to those who sing: “There is none holy beside Thee, O Lord, Lover of mankind. The soldiers keeping watch over Thy tomb, O Saviour, became as dead men from the shining brightness at the appearing of the angel, who proclaimed to the women the Resurrection. We glorify Thee as the Destroyer of corruption; we fall down before Thee, risen from the tomb, our only God. Irmos, Tone 6: Foreseeing Thy divine self-emptying upon the Cross, Habakkuk, amazed, cried out: “Thou hast cut asunder the strength of the mighty, O Good One, and preached to those in hades, as the Almighty One. Today Thou hast sanctified the seventh day, which anciently Thou didst bless by resting from Thy works. Thou bringest all things into being and renewest all things, observing the sabbath, O my Saviour, and restoring all. By Thy greater power, Thou hast conquered; from the flesh Thy soul was parted, yet Thou hast burst asunder both bonds, death and hades, O Word, by Thy might. Hades was embittered when it met Thee, O Word, for it saw a mortal deified, striped with wounds, yet all-powerful; and it shrank back in terror at this sight. Katavasia, Tone 6: Foreseeing Thy divine self-emptying upon the Cross, Habakkuk, amazed, cried out: “Thou hast cut asunder the strength of the mighty, O Good One, and preached to those in Hades, as the Almighty One. Thou makest new those of earth, O Creator, becoming a thing of dust, and the winding-sheet and tomb reveal, O Word, the mystery that is within Thee; for the noble counselor typifies the counsel of Him that begat Thee, Who hath majestically refashioned me in Thee. By Thy death dost Thou transform mortality and by Thy burial, corruption, for Thou makest incorruptible, by divine majesty, the nature Thou hast taken, rendering it immortal; for Thy flesh saw not corruption, O Master, nor was Thy soul left in Hades as that of a stranger. Coming forth from an unwedded Mother, and wounded in Thy side with a spear, O my Maker, Thou hast brought to pass the re-creation of Eve. Becoming Adam, Thou hast in ways surpassing nature slept a nature-restoring sleep, raising life from sleep and from corruption, for Thou art the Almighty. Torn wast Thou, but not separated, O Word, from the flesh of which Thou hadst partaken; for though Thy temple was destroyed at the time of Thy Passion, yet the Substance of Thy Godhead and of Thy flesh is but one. For in both Thou art one Son, the Word of God, both God and man. Fatal to man, but not to God, was the sin of Adam; for though the earthly substance of Thy flesh suffered, yet the Godhead remained impassable; that which in Thy nature was corruptible Thou hast transformed to incorruption, and a fountain of life incorruptible hast Thou revealed by Thy Resurrection. Hades reigneth, but not for ever over the race of man; for Thou, laid in a tomb, O Sovereign Lord, hast burst asunder the bars of death with Thy life-giving hand, and Thou hast proclaimed to those who slept from the ages the true redemption, O Saviour, Who art become the Firstborn from the dead. Irmos, Tone 6: Be ye astonished and afraid, O heaven, and let the foundations of the earth be shaken; for lo, He Who dwelleth on high is numbered with the dead and lodgeth as a stranger in a narrow tomb. Him do ye children bless, ye priests praise, and ye people supremely exalt unto all ages. The most pure Temple is destroyed, but raiseth up the fallen tabernacle. For the second Adam, He Who dwelleth on high, hath come down to the first Adam, even into the chambers of hades. Him do ye children bless, ye priests praise, and ye people supremely exalt unto all aces. The disciples’ courage failed, but Joseph of Arimathea was bolder; for, seeing the God of all a corpse and naked, he asked for the body and buried Him, crying: Him do ye children bless, ye priests praise, and ye people supremely exalt unto all ages. O new wonders! O what goodness! O ineffable forbearance! For of His own will He Who dwelleth on high is sealed beneath the earth, and God is falsely accused as a deceiver. Him do ye children bless, ye priests praise, and ye people supremely exalt unto all ages. Katavasia, Tone 6: Be ye astonished and afraid, O heaven, and let the foundations of the earth be shaken; for lo, He Who dwelleth on high is numbered with the dead and lodgeth as a stranger in a narrow tomb. Him do ye children bless, ye priests praise, and ye people supremely exalt unto all ages. Irmos, Tone 6: Weep not for Me, O Mother, beholding in the tomb the Son Whom thou hast conceived without seed in the womb; for I shall arise and shall be glorified, and as God I shall exalt with glory unceasing those that with faith and love magnify thee. At Thy strange birth, O Son without beginning, I was blessed in ways surpassing nature, for I was spared all travail. But now, beholding Thee, my God, a lifeless corpse, I am pierced with the sword of bitter grief. But arise, that I may be magnified. The earth covereth Me as I desire, O Mother, but the gatekeepers of hades tremble as they see Me, clothed in the bloodstained garment of vengeance; for on the Cross as God have I struck down Mine enemies, and I shall rise again and magnify thee. Let creation rejoice, let all that are born of earth be glad, for the enemy, Hades, hath been despoiled; let the women come with myrrh to meet Me, for I am delivering Adam and Eve with all their offspring, and on the third day I shall rise again. Katavasia, Tone 6: Weep not for He, O Mother, beholding in the tomb the Son Whom thou hast conceived without seed in the womb; for I shall arise and shall be glorified, and as God I shall exalt with glory unceasing those that with faith and love magnify thee. Priest:For Thine is the Kingdom, and the power, and the glory; of the Father, and of the Son, and of the Holy Spirit, now and ever, and unto the ages of ages. Choir: When Thou didst descend unto death, O Life Immortal, then didst Thou slay Hades with the lightning of Thy Divinity. And when Thou didst also raise the dead out of the nether-most depths, all the hosts of the heavens cried out: O Life-giver, Christ our God, glory be to Thee. Priest: Have mercy on us, O God, according to Thy great mercy, we pray Thee, hearken and have mercy. Priest: Again let us pray for Our Great Lord and Father, His Holiness Catholicos Ilia, Patriarch of All Georgia ; for our lord the Very Most Reverend Metropolitan N., and all our brethren in Christ. Priest: Again we pray for all the brethren and for all Christians. Priest: For a merciful God art Thou, and the Lover of mankind, and unto Thee do we send up glory: to the Father, and to the Son, and to the Holy Spirit, now and ever, and unto the ages of ages. Priest: May Christ our true God, Who rose from the dead, through the intercessions of His most pure Mother, of our holy and God-bearing fathers, and of all the saints, have mercy on us and save us, for He is good and the Lover of mankind. As this is chanted the third time, the clergy go out of the church in procession, followed by all the faithful. After going around the church, the clergy stop at the closed doors. Senior Clergyman: Glory to the holy, and consubstantial, and life-creating, and indivisible Trinity, always, now and ever, and unto the ages of ages. People: INDEED HE IS RISEN! Stichos 1: Let God arise and let His enemies be scattered, and let them that hate Him flee from before His face. Choir: Christ is risen from the dead, trampling down death by death, and upon those in the tombs bestowing life. Stichos 2: As smoke vanisheth, so let them vanish, as wax melteth before the fire. Stichos 3: So let the sinners perish at the presence of God, and let the righteous be glad. Stichos 4: This is the day which the Lord hath made; let us rejoice and be glad therein. Priest: Glory to the Father and to the Son and to the Holy Spirit. Priest: Both now and ever, and unto the ages of ages. Amen. Priest: Christ is risen from the dead, trampling down death by death. Choir: And upon those in the tombs bestowing life. And all enter the church. The Priest (or clergy) stand before the icon of the Resurrection in the center of the church. And the Great Litany is said. Deacon:In peace let us pray to the Lord. Deacon: For the peace from above, and the salvation of our souls, let us pray to the Lord. Deacon:For the peace of the whole world, the good estate of the holy churches of God, and the union of all, let us pray to the Lord. Deacon:For this holy temple, and for them that with faith, reverence, and the fear of God enter herein, let us pray to the Lord. Deacon: For our Great Lord and Father, His Holiness Catholicos Ilia, Patriarch of All Georgia. ; for our lord the Very Most Reverend Metropolitan N., for the venerable priesthood, the diaconate in Christ, for all the clergy and people, let us pray to the Lord. Deacon:For this land, its authorities and armed forces, let us pray to the Lord. Deacon:That He may deliver His people from enemies both visible and invisible, and confirm in us oneness of mind, brotherly love and piety, let us pray to the Lord. Deacon:For this city (or this town, or this holy monastery), for every city and country, and the faithful that dwell therein, let us pray to the Lord. Deacon:For seasonable weather, abundance of the fruits of the earth, and peaceful times, let us pray to the Lord. Deacon:For travelers by sea, land and air; for the sick, the suffering, the imprisoned, and for their salvation, let us pray to the Lord. Deacon:That we may be delivered from all tribulation, wrath, and necessity, let us pray to the Lord. Deacon:Help us, save us, have mercy on us, and keep us, O God, by Thy grace. Deacon:Calling to remembrance our most holy, most pure, most blessed, glorious Lady Theotokos and Ever-Virgin Mary with all the saints, let us commit ourselves and one another and all our life unto Christ our God. Priest: For unto Thee is due all glory, honor and worship; to the Father, and to the Son, and to the Holy Spirit, now and ever, and unto the ages of ages. as we sing the song of victory. Refrain: Christ is risen from the dead. as we sing the hymn of victory. Priest: For Thine is the dominion, and Thine is the kingdom, and the power, and the glory: of the Father, and of the Son, and of the Holy Spirit, now and ever, and unto the ages of ages. in Whom we are strengthened. Priest: For Thou art our God, and unto Thee do we send up glory: to the Father, and to the Son, and to the Holy Spirit, now and ever, and unto the ages of ages. and as true God, perfect was He proclaimed. shone forth again upon us. for Christ is risen as Almighty. Priest: For Thou art a good God, and the Lover of mankind, and unto Thee do we send up glory: to the Father, and to the Son, and to the Holy Spirit, now and ever, and unto the ages of ages. Who causeth life to dawn for all. the saving Pascha of God. Priest: For sanctified and glorified is Thy most honorable and majestic name: of the Father, and of the Son, and of the Holy Spirit, now and ever, and unto the ages of ages. Thou didst arise from the tomb. when Thou didst rise from the tomb. Priest: For Thou art the King of peace, and the Savior of our souls, and unto Thee do we send up glory: to the Father, and to the Son, and to the Holy Spirit, now and ever, and unto the ages of ages. and bestowing resurrection on the fallen. The myrrh-bearing women forestalled the dawn, seeking, as it were day, the Sun that was before the sun and Who had once set in the tomb, and they cried out one to another: O friends! come, let us anoint with spices the life-bringing and buried Body, the Flesh that raised up fallen Adam, that now lieth in the tomb. Let us go, let us hasten, like the Magi, and let us worship and offer myrrh as a gift to Him Who is wrapped now not in swaddling clothes but in a shroud. And let us weep and cry aloud: O Master, arise, Thou Who dost grant resurrection to the fallen. the good tidings of the mystical Pascha. the only blessed and most glorious God of our fathers. from the tomb upon all hath shined. Priest: Blessed and most glorified be the dominion of Thy kingdom: of the Father, and of the Son, and of the Holy Spirit, now and ever, and unto the ages of ages. wherein we bless Christ unto the ages. thy children, in thee blessing Christ unto the ages. Refrain: O Most Holy Trinity, our God, glory be to Thee. and Thee will we bless unto all ages. Priest: For blessed is Thy name, and glorified is Thy kingdom: of the Father, and of the Son, and of the Holy Spirit, now and ever, and unto the ages of ages. Refrain: Magnify, O my soul, Him Who willingly suffered, and was buried, and rose from the grave on the third day. in the arising of Him Whom thou didst bear. Refrain: Magnify, O my soul, Christ the Giver of life, Who arose from the grave on the third day. Refrain: Christ is the new Pascha, the living-sacrifice, the Lamb of God that taketh away the sin of the world. Refrain: Today all creation is glad and rejoiceth, for Christ is risen, and hades is led in captivity. Refrain: Magnify, O my soul, the dominion of the Tri-hypostatic and Indivisible Godhead. Refrain: Rejoice, O Virgin, rejoice; rejoice O blessed one; rejoice, O most glorified one: for thy Son is risen on the third day from the grave. Priest: For all the hosts of heaven praise Thee, and unto Thee do we send up glory: to the Father, and to the Son, and to the Holy Spirit, now and ever, and unto the ages of ages. Praise Him, ye heavens of heavens, and thou water that art above the heavens. Let them praise the name of the Lord; for He spake, and they came to be; He commanded, and they were created. He established them for ever, yea, for ever and ever; He hath set an ordinance, and it shall not pass away. Praise the Lord from the earth, ye dragons, and all ye abysses. Fire, hail, snow, ice, blast of tempest, which perform His word. The mountains and all the hills, fruitful trees, and all cedars. The beasts and all the cattle, creeping things and winged birds. Young men and virgins, elders with the younger; let them praise the name of the Lord, for exalted is the name of Him alone. His praise is above the earth and heaven, and He shall exalt the horn of His people. Let Israel be glad in Him that made him, let the sons of Zion rejoice in their King. For the Lord taketh pleasure in His people, and He shall exalt the meek with salvation. The saints shall boast in glory, and they shall rejoice upon their beds. To do vengeance among the heathen, punishments among the peoples. To do among them the judgment that is written. This glory shall be to all His saints. Praise ye God in His saints, praise Him in the firmament of His power. Stichos: Praise Him for His mighty acts, * praise Him according to the multitude of His greatness. Tone 1: We hymn, O Christ, Thy saving Passion, // and glorify Thy Resurrection. Stichos: Praise Him with the sound of trumpet, * praise Him with the psaltery and harp. O Thou Who didst endure the Cross, / and didst abolish death, / and didst rise again from the dead: / Make our life peaceful, O Lord, // for Thou alone art almighty. Stichos: Praise Him with timbrel and dance, praise him with strings and flute. O Thou Who didst lead hades captive, / and didst raise up man by Thy Resurrection, / deem us worthy, with pure hearts, // to hymn and glorify Thee. Stichos: Praise Him with tuneful cymbals, praise Him with cymbals of jubilation. * Let every breath praise the Lord. Glorifying Thy Godly-majestic condescension, / we hymn Thee, O Christ; / for Thou wast born of a Virgin, / yet Thou didst remain inseparable from the Father; / Thou didst suffer as a man, and willingly didst endure the Cross; / Thou didst rise from the tomb, / coming forth as from a bridal chamber, / that Thou mightest save the world: // O Lord, glory be to Thee. Stichos: Let God arise and let His enemies be scattered. A Pascha sacred today hath been shown unto us; Pascha new and holy, a Pascha mystical, a Pascha all-venerable! A Pascha that is Christ the Redeemer; a Pascha immaculate, a great Pascha; a Pascha of the faithful; a Pascha that hath opened the gates of Paradise to us; a Pascha that doth sanctify all the faithful. Stichos: As smoke vanisheth, so let them vanish. Come from the vision, O ye women, bearers of good tidings, * and say ye unto Zion: * Receive from us the good tidings * of the Resurrection of Christ; * adorn thyself, exult, * and rejoice, O Jerusalem, * for thou hast seen Christ the King, * like a bridegroom come forth from the tomb. Stichos: So let sinners perish at the presence of God, and let the righteous be glad. The myrrh-bearing women * in the deep dawn * stood before the tomb of the Giver of life; * they found an angel sitting upon the stone, * and he, speaking to them, said thus: * Why seek ye the Living among the dead? *Why mourn ye the Incorruptible amid corruption? *Go, proclaim unto His disciples. Stichos: This is the day which the Lord hath made, let us rejoice and be glad therein. Pascha the beautiful, * Pascha, the Lord’s Pascha, * the Pascha all-venerable hath dawned upon us. * Pascha, with joy let us embrace one another. * O Pascha! * Ransom from sorrow, * for from the tomb today, * as from a bridal chamber, * hath Christ shone forth, * and hath filled the women with joy, saying: * Proclaim unto the apostles. It is the Day of Resurrection, * let us be radiant for the feast, * and let us embrace one another. * Let us say, Brethren, even to them that hate us, * let us forgive all things on the Resurrection, * and thus let us cry out: *Christ is risen from the dead, trampling down death by death, and upon those in the tombs bestowing life. Choir: Grace shining forth from thy mouth like a beacon hath illumined the universe, / and disclosed to the world treasures of uncovetousness, / and shown us the heights of humility; / but while instructing by Thy words, O Father John Chrysostom, // intercede with the Word, Christ our God, to save our souls. Deacon: Have mercy on us, O God, according to Thy great mercy, we pray Thee, hearken and have mercy. Deacon: Again we pray for our Great Lord and Father, His Holiness Patriarch N.; for our lord the Very Most Reverend Metropolitan N., First Hierarch of the Russian Church Abroad; for our lord the Most Reverend (Archbishop or Bishop N., whose diocese it is) and all our brethren in Christ. Deacon: Again we pray for the God-preserved land and its Orthodox people both in the homeland and in the diaspora and for their salvation. Deacon: Again we pray for this land, its authorities and armed forces. Deacon: Again we pray to the Lord our God that He may deliver His people from enemies visible and invisible, and confirm in us oneness of mind, brotherly love and piety. Deacon: Again we pray for our brethren, the priests, priestmonks, and all our brethren in Christ. Choir: Lord have mercy. Thrice. Deacon: Again we pray for the blessed and ever-memorable, holy Orthodox patriarchs; for pious kings and right-believing queens; and for the founders of this holy temple (if it be a monastery: this holy monastery): and for all our fathers and brethren gone to their rest before us, and the Orthodox here and everywhere laid to rest. Deacon: Again we pray for them that bring offerings and do good works in this holy and all-venerable temple; for them that minister and them that chant, and for all the people here present, that await of Thee great and abundant mercy. Deacon: Let us complete our morning prayer unto the Lord. Deacon: Help us, save us, have mercy on us, and keep us, O God, by Thy grace. Deacon: That the whole day may be perfect, holy, peaceful and sinless, let us ask of the Lord. Deacon: Pardon and remission of our sins and offences, let us ask of the Lord. Deacon: Things good and profitable for our souls, and peace for the world, let us ask of the Lord. Choir: Grant this. O Lord. Deacon: A Christian ending to our life, painless, blameless, peaceful, and a good defense before the dread judgment seat of Christ, let us ask. Deacon: Calling to remembrance our most holy, most pure, most blessed, glorious Lady Theotokos and Ever-Virgin Mary with all the saints, let us commit ourselves and one another and all our life unto Christ our God. Priest: For a good God art Thou, and the Lover of mankind, and unto Thee do we send up glory: to the Father, and to the Son, and to the Holy Spirit, now and ever, and unto the ages of ages. Priest: For Thine it is to show mercy and to save us, O our God, and unto Thee do we send up glory: to the Father, and to the Son, and to the Holy Spirit, now and ever, and unto the ages of ages. Priest: He that is, is blessed, Christ our God, always, now and ever, and unto the ages of ages. Choir: Amen. Establish, O God, the holy Orthodox Faith and Orthodox Christians, unto the ages of ages. Choir: And upon those in the tombs bestowing life! Priest: May Christ our true God, Who rose from the dead, and trampled down death by death and upon those in the tombs bestowed life, through the intercessions of His most pure Mother, and of all the saints, have mercy on us and save us, for He is good and the Lover of mankind. And unto us hath He granted life eternal; we worship His Resurrection on the third day. We have referred to Saint John Chrysostom many times in this blog. His homilies are as fresh today as when he first uttered them in Constantinople in the late 4th century, and his keen understanding of human nature remains relevant. Saint John Chrysostom has a special place in the hearts of Georgian Christians, as he was deposed by the Roman Empress and exiled to Colchis, where he died in the town of Pitsunda in Abkhazeti. His relics were a site of pilgrimage for many years until relocated to Constantinople. At the end of the Paschal Matins service on Saturday night, his homily is read out throughout the world to the congregation by the priest, in Greek, Slavonic, Arabic, Georgian, Romanian or whatever vernacular language the bishop may feel appropriate. The homily has a victorious tone which reflects the Orthodox concept of Christ, as a victorious Warrior-King who has battled the Devil and won, broken down the gates of Hell and liberated the souls of the dead to be reunited with their Father. There is no “Gentle Jesus Meek and Mild” concept of Jesus in the Orthodox Church; he is Almighty God, existing before all ages, Lord of the Universe and Conqueror of Death, and the homily reflects this concept very ably. The homily is particularly poignant for recent converts, as Saint John Chrysostom declares that even those who have joined the Church at the very last hour, late in life or after a dissolute existence, may share in the the redemption granted by Christ’s Resurrection, on equal terms with those who have been faithful Christians since the cradle. The Greek word “Hades” in Christian usage, represents Hell; the state in which the souls of those who have rejected Christ await their Final Judgement in sorrow, far from God. Until Christ’s entry into the Underworld and his conquest of Death, the souls of all people, good and bad, lived in this state of sorrow. His defeat of the Devil liberated the souls of the righteous to exist in joyful close proximity with God, awaiting the final Resurrection of the Dead. Note again that Christ’s Resurrection is described in the present tense rather than past tense; the congregation are not commemorating a distant past event but living through a current miracle. If anyone has arrived even at the eleventh hour, let him not fear on account of his delay. For the Master is gracious and receives the last, even as the first; he gives rest to him that comes at the eleventh hour, just as to him who has labored from the first. He has mercy upon the last and cares for the first; to the one he gives, and to the other he is gracious. He both honors the work and praises the intention. It took a body and, face to face, met God! It took what it saw but crumbled before what it had not seen! Saturday night at midnight we celebrate the great feast of Pascha. After the drama and anguish of reliving Christ’s crucifixion, death and descent into Hell, we await His resurrection with great anticipation. 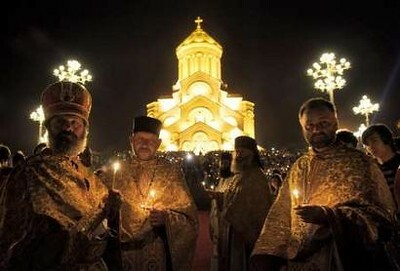 Orthodox Christians refer to the Feast of Christ’s Resurrection as Pascha (Pasqa in Georgian), with the word derived from the Hebrew “Pascha” meaning Passover. “Easter” is a Germanic word referring to the month in the pagan calender which Pascha was celebrated in the early days of Christianity in northern Europe. 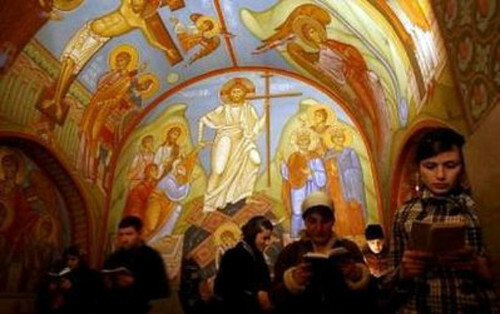 It is not incorrect to use the term Easter, but it is usually preferred to use the term Pascha and it eases communication with other Christians throughout the region. Churches are extraordinarily packed for this event so one needs to arrive at least 90 minutes early to be able to enter the church. Entering around 9 or 9.30 pm is recommended. The Paschal services are combined end-to-end, with the services running continuously until dawn. Upon entry to the church, you will see the Epitaphios entombed on its table in the centre of the church, surrounded by flowers. The faithful venerate the Epitaphios and await the beginning of the Midnight Office, a service of psalms and odes that reflect upon the meaning of Christ’s death and His Harrowing of Hell. The Midnight Office culminates with the Epitaphios being moved to the altar by the priest, where it will stay for the forty days until the Feast of the Ascension. The lights are extinguished and, in less crowded circumstances, the congregation will withdraw outside the church with candles. In Georgia’s very crowded cathedrals this is not possible so instead the clergy withdraw outside the church. The whole church is then likened to a tomb, with the faithful waiting outside for the Resurrection and the doors locked. The clergy will proceed around the church, bearing banners and chanting, and upon reaching the doors of the “tomb”, the Paschal Troparion “Krist’e Aghsdga” is triumphantly sung for the first time. The triumphant psalm 67 “Let God Arise” is chanted by the priest, with the Paschal Troparion repeated many times. The doors are opened and the faithful re-enter. The church is brightly lit and symbolic of the empty tomb. The Easter icon replaces the tomb in which the Epitaphios was laid, showing Christ destroying the gates of hell and freeing Adam and Eve from the captivity of death. The priests will declare: “Krist’e Aghsdga!! (Christ is Risen!! )” , to which the congregation joyfully respond “Cheshmaritad Aghsdga!! (Indeed He is Risen!!). It is not uncommon for the priest to also make this declaration in Greek (Christos Anesti!/Aleithos Anesti!) and Slavonic (Hristos Voskrese! !/Voistuna voskrese!! ), with the congregation responding accordingly. O day of resurrection! Let us beam with God’s own pride! Let everyone embrace in joy! Let us warmly greet those we meet and treat them all like brothers, even those who hate us! Let all the earth resound with this song: Christ is risen from the dead, conquering death by death, and on those in the grave bestowing life! Next, the Paschal Hours are also sung. At the conclusion, the priest proclaims the famous Paschal Homily of St. John Chrysostom. The Paschal Divine Liturgy begins with the singing once more of the Paschal Troparion with the verses of Psalm 67 . The antiphons of the liturgy are special psalm verses that praise and glorify the salvation of God. Again, the troparion Krist’e Aghsdga is repeated over and over again. The readings take the faithful back again to the beginning, and announces God’s creation and re-creation of the world through the living Word of God, his Son Jesus Christ. The epistle reading is the first nine verses of the Acts of the Apostles. The gospel reading is the first seventeen verses of the Gospel of Saint John (“In the beginning was the Word”) . The Liturgy of St John Chrysostom continues as usual, and all Orthodox Christians who have made confession will take Holy Communion. For some older people, Pascha may be the only day of the year they take Communion. To the Orthodox, the celebration of Pascha reveals the mystery of the eighth day. It is not merely an historical reenactment of the event of Christ’s Resurrection. It is a way to experience the new creation of the world, a taste of the new and unending day of the Kingdom of God. This new day is conveyed to the faithful in the length of the paschal services, in the repetition of the paschal order for all the services of Bright Week (the week following Pascha), and in the special paschal features retained in the services for the forty days until Ascension. Forty days are, as it were, treated as one day. The text of the Holy Saturday Matins is deeply moving and poetic, with very dramatic hymns. It is performed late at 6 a.m. Saturday. An English translation is provided here, kindly translated by nuns of The Community of Holy Myrrhbearers in New York. The service on Holy Thursday evening incorporates twelve Gospel readings covering these events. The service is deeply moving and dramatic. An English translation of the Holy Friday Matins, performed on Thursday night, is provided here , courtesy of nuns of the Community of Myrrhbearers of New York. Holy Friday (Good Friday) involves the second-most dramatic service of the Church year, the reenactment of Christ’s crucifixion, death and entombment. Late in the morning, the priest will instal the Epitaphios (an icon embroidered on silk, of Christ’s dead body lying surrounded by his mother and his closest followers) on the altar. A wooden icon of Christ crucified is placed in the centre of the church. The service of the Deposition from the Cross involves a number of gospel readings recounting Christ’s Passion, death and removal from the cross. Before the service, the Icon is removed from the centre of the church and moved to the sanctuary. Towards the end of the service, the Epitaphios is borne by the priests, as if they are pall-bearers, from the altar to a table in the centre of the church, representing Christ’s tomb. The priest carrying the Gospel walks beneath the Epitaphios. The Epitaphios is reverently laid down on the table, surrounded by flowers, as a recapitulation of His entombment, and a copy of the Gospel placed on top of the Epitaphios. The congregation will have already surrounded the tomb with flowers, eggs dipped in red dye, cakes, and even small punnets of sprouting barley. Some of this symbolism may be pre-Christian in origin but is consistent with Christian principles. The “tomb” is censed and the congregation will file past to venerate the Epitaphios within the “tomb”. The hymns for this service are very beautiful; Paliashvili’s arrangement of the Trisagion (Holy God, Holy Mighty, Holy Immortal, have mercy on us!) is commonly sung. Services at Sameba and Sioni cathedrals start at 2 pm Friday; if attending, you will need to arrive at least an hour early to get into the church. On the Wednesday evening of Holy Week, a Liturgy is held at the conclusion of which all the baptised Orthodox Christians in the congregation are anointed with oil, to heal their spiritual and physical ills. Holy Unction is considered one of the seven sacraments, the others of which are baptism, marriage, chrismation, eucharist, confession, and ordination. The practice follows Apostolic Tradition, mentioned in the New Testament “…let him call for the elders of the church, and let them pray over him, anointing him with oil in the name of the Lord; and the prayer of faith will save the sick man, and the Lord will raise him up; and if he has committed sins, he will be forgiven” (James 5:14-15). The full service is composed of psalms from the Old Testament, hymns of direct supplication to God, and prayers to the saints to intercede for the petitioner. In addition, there are seven readings from the Gospels preceded by seven other New Testament writings, notably the epistlesof Saint Paul and Saint James. After each set of scriptural readings, a prayer is offered on behalf of the penitent by the priestasking for forgiveness and the sanctification of the oil. Traditionally, the service is celebrated by seven priests, but where fewer than seven priests are available (which is often the case), it will be served by at least one. At the end of the service, the priestputs holy oil on the forehead, eyes, ears, nostrils, lips, chest, and hands of the parishioners in the form of the cross and blesses the recipient.